Tiny Iowa is worth just six electoral votes, but it’s surprisingly important to the electoral math. Iowa holds the keys to Colorado: if Obama lost Iowa, then a victory in Colorado wouldn’t get him over the top without winning another tipping point state, like Ohio or Virginia. If Obama lost Wisconsin but won Ohio, a win in Iowa (as well as Nevada and New Hampshire) could make up for lost ground. And victory in Iowa would be enough to reelect Obama if he also won Ohio and Wisconsin. Unfortunately, the Hawkeye State hasn’t received much attention from the pollsters, making it harder to judge than most states. Back in the spring, NBC moved Iowa to “Lean Romney” based on insider sources, but there weren’t enough polls to confirm whether Romney held an advantage. The state's history suggested that Obama might have an edge in a close race, but demographics pointed toward possible vulnerability for the president. By the summer, Iowa was back in the toss-up column and NBC moved Iowa to “Lean Obama” after the DNC. But the polls didn’t necessarily back up that determination, either. In September, a simple average showed Iowa near the national average, although a closer look hinted at a larger Obama advantage commensurate with his lead in Nevada or Ohio. Since the debate, only three pollsters have surveyed the state and they’re not an especially diverse group, either. However, there are signs that Iowa might be one of Romney’s weaker battleground states and one of Obama’s best. Two of the three post-debate polls conducted surveys after the DNC, and Obama didn't do much worse than the pre-DNC counterpart. The WAA poll only found Obama losing by one point and Rasmussen actually showed Obama gaining 5 points (although their prior survey was unrealistically strong for Romney). 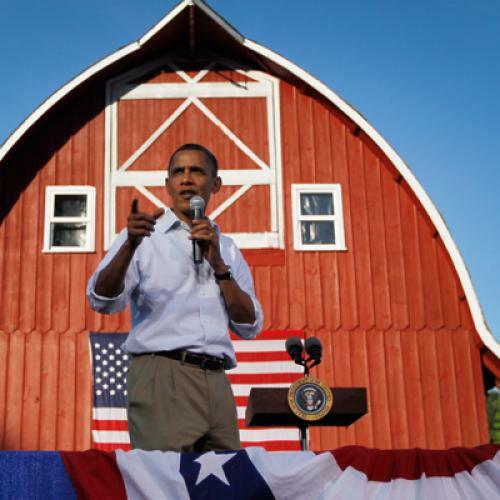 And although the three pollsters to survey Iowa aren’t especially strong, they have surveyed at least five battlegrounds each and found Obama doing better in Iowa than any other of the other battleground states that they surveyed. Given that Obama appeared to fare well in pre-debate polls, this is decent if incomplete evidence that Obama continues to hold a lead. The early voter numbers are also cause for Obama supporters to be cautiously optimistic. Nearly 250,000 people have already voted in Iowa and Democrats have outvoted Republicans by about 54,000. 430,000 have requested ballots and among them Democrats outnumber Republicans by 70,000. And so far, more than twice as many Democrats have participated in early voting than did by this point four years ago. But Republicans have been gaining over the last ten days, and have picked up 24,000 more ballots than Democrats over that time period (99,000 to 75,000). If Republicans continue to close the gap, the Democratic early voting edge might not be as strong as it was in 2008, when early voting Democrats outnumbered Republicans by 85,000 votes. And although Democrats are likely to outnumber Republicans in early voting, it won't necessarily prevent Romney from winning the state. In 2004, Democrats outnumbered Republicans in the early vote by about 37,000 votes, but Bush came over the top with a strong Election Day showing and won the state by 10,000 votes. Today, registered Iowa's Republicans outnumber registered Democrats by 10,000 votes, suggesting that the pool of available Election Day voters will lean decidedly toward Romney. The early voting numbers aren't an indicator of certain Democratic triumph, but they're consistent with an Obama advantage and the polls hint at an Obama lead, as well. Iowa is under-polled and it would be nice to get a few more surveys, especially from live interview pollsters. But the few available data points suggest that Iowa is one of Obama's stronger battleground states, even if only tentatively in the absence of more information.